Infrastructure is the backbone of well-functioning economies. Unfortunately, that backbone is becoming increasingly brittle in a number of advanced economies. For example, there has been a decline in the overall quality of infrastructure in the United States and Germany (Figure 1; see the FT 2014 and ASCE 2013 for more in infrastructure in the U.S., and Der Speigel 2014 and Kunert and Link 2013 for Germany). In many emerging market and developing economies, the expansion of the backbone has not kept pace with the broader economy, and this is stunting the ability of these economies to grow. 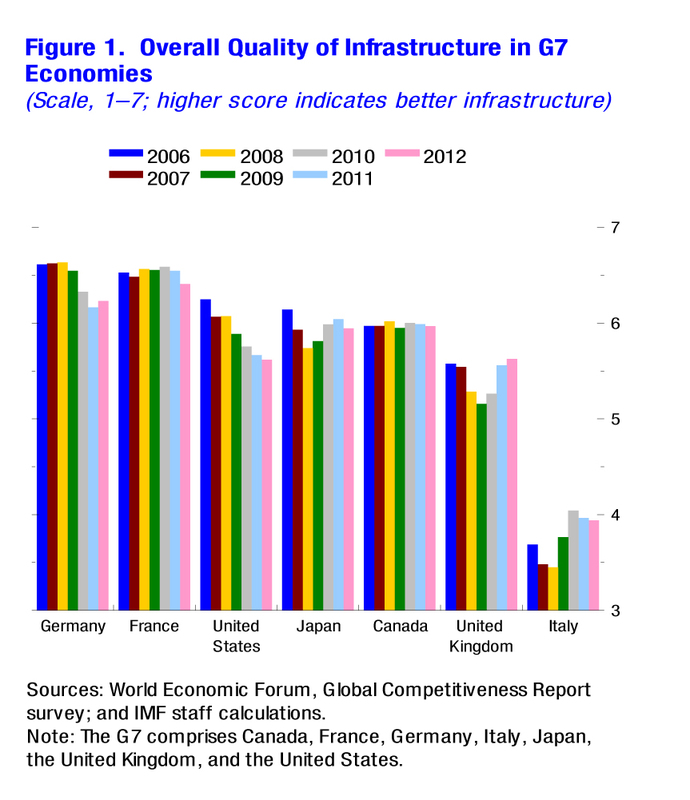 Our study—Chapter 3 in the October 2014 World Economic Outlook— examines the macroeconomic effects of public investment in a large number of countries and finds that in the current global environment of sub-par growth, there is a strong case for increasing public infrastructure investment in countries where conditions are right. The evolution of the stock of public capital—the most widely available proxy for infrastructure—suggests rising inadequacies in infrastructure provision. Public capital has declined significantly as a share of output over the past three decades in both advanced and developing countries (Figure 2). In advanced economies, public investment was scaled back from about 4 percent of GDP in the 1980s to 3 percent of GDP at present (maintenance spending has also fallen, especially since the financial crisis). 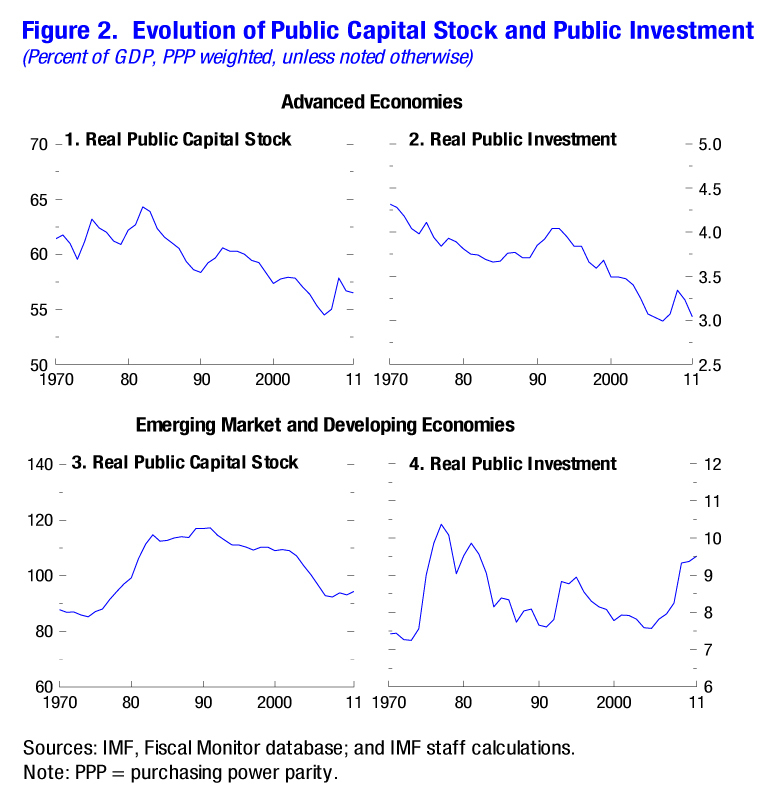 In emerging market and developing countries, sharply higher public investment in the late 1970s and early 1980s raised public capital stocks, but since then public capital relative to GDP has fallen. Does investing in infrastructure really pay off? In our study, which uses a combination of empirical analysis and model simulations, we find that increased public infrastructure investment can have powerful effects on the macroeconomy. It raises output in the short term by boosting demand and in the long term by raising the economy’s productive capacity. In a sample of advanced economies, a 1 percentage point of GDP increase in investment spending raises the level of output by about 0.4 percent in the same year and by 1.5 percent four years after the increase (Figure 3, panel 1). In addition, the boost to GDP a country gets from increasing public infrastructure investment tends to offset the rise in debt, so that the public-debt-to-GDP ratio does not rise (Figure 3, panel 2). In other words, public infrastructure investment could pay for itself, if done correctly. But the benefits depend on a number of factors. We find that the positive effects of increased public infrastructure investment are particularly strong if certain conditions are in place. 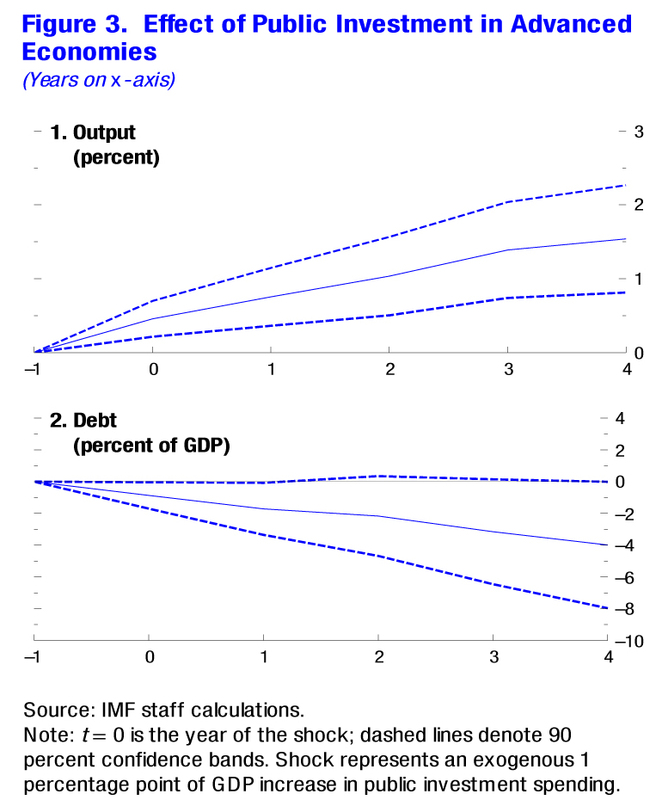 First, the short-term boost to output is substantially larger when public investment is undertaken during periods of economic slack and monetary policy accommodation, with the latter limiting the increase in interest rates in response to the rise in investment (Figure 4, panels 1 and 2). Second, the output effects are bigger in countries with a high degree of public investment efficiency—where additional public investment spending is not wasted and is allocated to projects with high rates of return (Figure 4, panels 3 and 4). 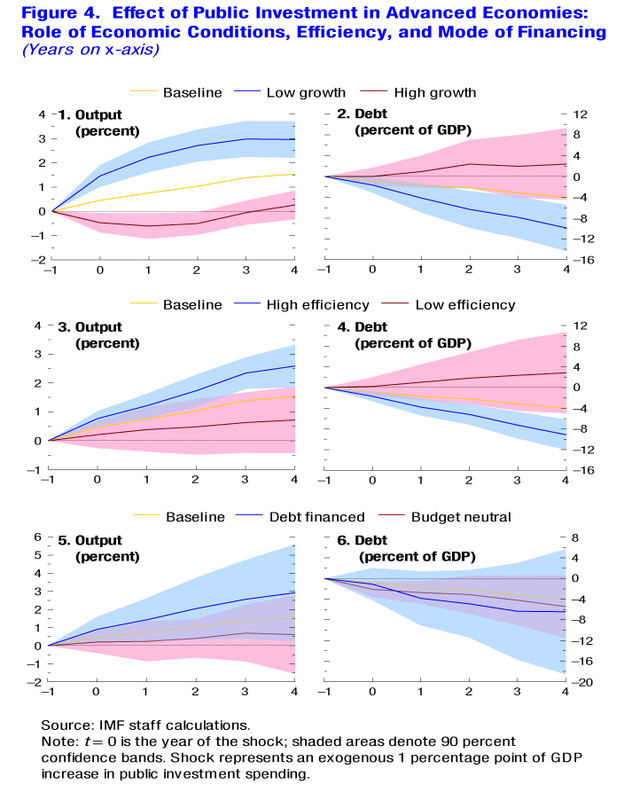 Finally, public investment that is financed by issuing debt has larger output effects than when it is financed by raising taxes or cutting other spending (Figure 4, panels 5 and 6). In this context, current conditions present a golden opportunity to increase public infrastructure investment in countries with infrastructure needs. In many advanced economies there is still substantial economic slack and interest rates are at historic lows—which means a bigger bang for the buck for such investment. Now is also a good time for many emerging market and developing countries to boost infrastructure investment. Many of these economies may not have the economic slack as in advanced economies, and their public investment processes tend to be less efficient. As a result, increased infrastructure investment may lead to a smaller boost to output, and may even come at the cost of higher public debt. But if infrastructure bottlenecks have been constraining growth—which is the case in Brazil, India, thePhilippines, and South Africa, just to name a few—the gains are still likely to be large. Now is a good time to invest in infrastructure. But invest well, where there is a clear need, and invest efficiently. Productive and efficient investment will provide a much-needed boost to output, both today and in the future. This piece is cross-posted from iMFdirect with permission.